A faulty repair on a Robocar caused a malfunctioning of the car’s responsibility circuits turning it into a lethal killing machine. Things got worse when the car, nicknamed Elvis, reprogrammed other cars to do the same. A deadly game of cat and mouse ensued between ‘Elvis’ and Judge-Marshal Dredd. At one point Dredd was captured (along with his Robo-servant Walter yet again) and held prisoner inside the killer car. The Riot Squad using corrosive spray fired from Corodo guns was able to melt the affected vehicles and halt the carnage. A long, possibly overly so, story that feels very similar to the Robot Wars story arc. The childlike killer car makes a reasonable villain who definitely has a lot of personality. The Tooley brothers were arrested after Judge-Marshal Dredd went undercover. The brothers disguised themselves using a face-change machine to look like 20th century comedians. With Dredd recording their confession in secret not even their lawyer, the notorious Many Bloom, could get them off. 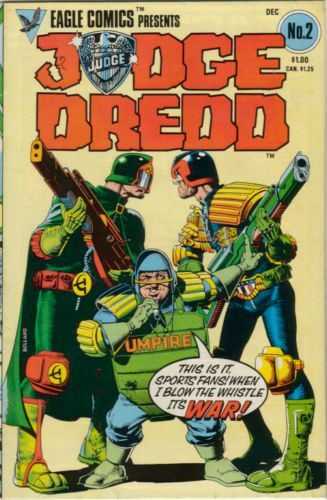 A quirky premise and Bolland really delivers some outstanding likenesses. The opening page really makes you sit up and take notice with this unusual spectacle. 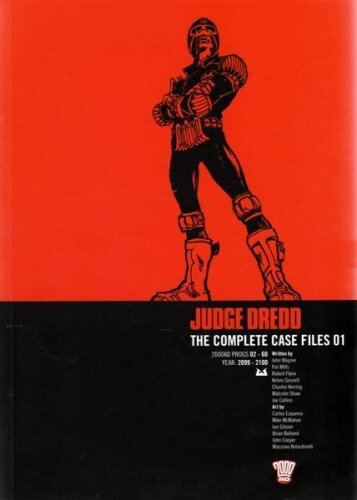 Good sci-fi with the face change machine and Dredd catches them through his wits not his fists. First Ever Luna Olympics end in WAR! Sov-Cities athlete Nicolai Zilch, famed for his bionic thighs, was disintegrated just before crossing the finish line in the 100 meters sprint. His alleged assassin was apprehended by visiting Sov-Cities Judges but in a scuffle that followed involving Judge-Marshal Dredd Judge Kolb was killed. Official Statement is that “it was an accident, a ricochet.” Immediately afterwards Judge Cosmovich speaking for the Sov-Cities, who were joint first in the medal table, declared war on Luna-1. A superb story with some good sci-fi politics and weaponry. Here is the first appearance of the Sov Judges. Cold War-a-go-go. In a shocking move recently appointed Judge-Marshal Joe Dredd handed in his gun, badge and helmet after failing to capture bad-lands gang leader Butch Carmody. But it was all a trick to bait and trap Carmody. Dredd who faked his own death recently to capture a corrupt Judge back in Megacity One once again showed subterfuge is one of the Judges greatest weapons.